Last April my dad and I went on a day trip to Anza-Borrego Desert State Park. We had heard about some mud caves, but they were not noted on the park map. After a little research on the Internet and reading a local guide, we were able to find directions on how to get to the Arroyo Tapiado Mud caves. 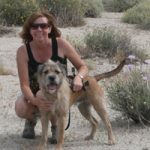 One of the best guides I’ve found about the area is called Anza-Borrego Desert Region by Lowell and Diana Lindsay. You can buy it on our main Web site DesertUSA.com. The book covers every inch of the park and it has suggested road trips outlined with mileage and details including a map of the park. With the use of the guidebook and map, the mud caves were fairly easy to find. The caves are located in the southwestern portion of the park off of the S-2. There are more than 22 caves and 9 slot canyons that have been created by water erosion. The caves are literally made out of mud and it you walk on the hills above them you are at great risk for falling through into a cave and collapsing the cave. DO NOT WALK ON TOP of the caves. You could get seriously injured. The area on top is made up of a fragile, crust-like mud that is very easily damaged by foot traffic, so please stay on the canyon floor and off of the mud hills! It is not recommended to go after a recent rain as the water changes the composition of the mud that can cause cave-ins and arches to collapse. Go when it is dry. During my trip I had the opportunity to explore about 3 or 4 of the caves. We had to head out to another area after the caves, so our visit was a short one. We have made a video that shows our road trip with footage of the road up to the caves. The video takes you inside the caves and gives you a feel for what you will experience when you explore the caves. 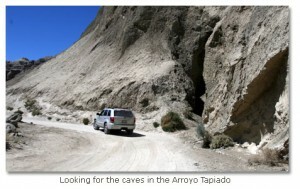 Use the links below to view the video of the Arroyo Tapiado Mud Caves. If you go, take a head lamp (or flash light), one for each person. Pack plenty of water and food. The caves are a nice reprieve from the heat. They are much cooler than the temperatures outside. Some caves are pitch black, so a light source is necessary. Some are longer than others. 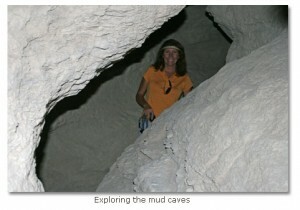 For more information on the Arroyo Tapiado Mud Caves visit our DesertUSA.com Web site. We have a full page with a detailed description of the caves, a map and directions and other interesting facts. Click on the links below view the article about the mud caves. Be careful here. A hiker fell to his death in one of these caves in 2012 and wasn’t discovered for weeks.